June 1, 2016 By Natalie 4 Comments This post may contain affiliate links. Read my disclosure policy here. Sewing Machine with neutral colored thread (optional). 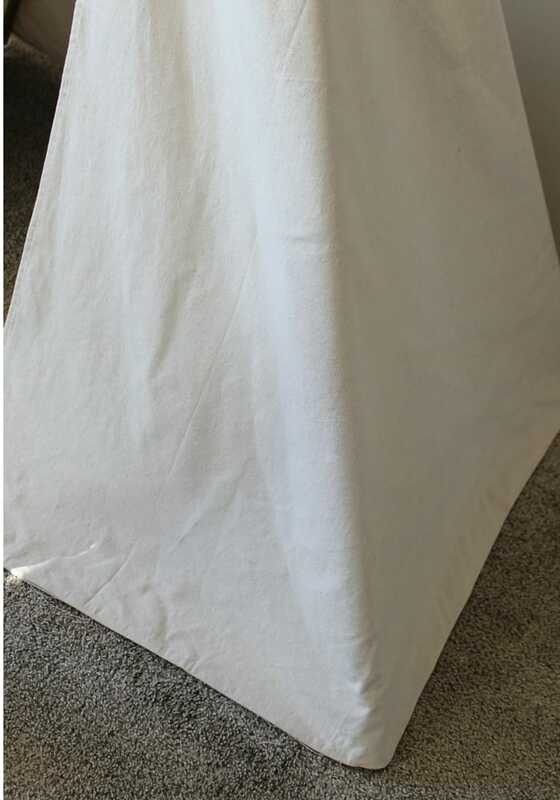 4 x 15 foot canvas drop cloth – you can find a similar one here or at the hardware store. 4 pieces of PVC pipe (.5 inch wide). Have the people at the hardware store cut each piece to be 5 1/2 feet tall for you. 4 caps for the PVP pipes (optional). I put these on the end that had been cut since they were a little jagged (touching the floor so they wouldn’t be seen). 1-2 cans of spray paint in the color of your choice (I used gold). Just make sure it’s meant to adhere to plastic. Supplies of your choice for decorating. Can we just talk for a moment about how obsessed I am with canvas drop cloths?! They are my go to material for craft projects! So far I have made a headboard and recovered my rocking chair cushions with it. 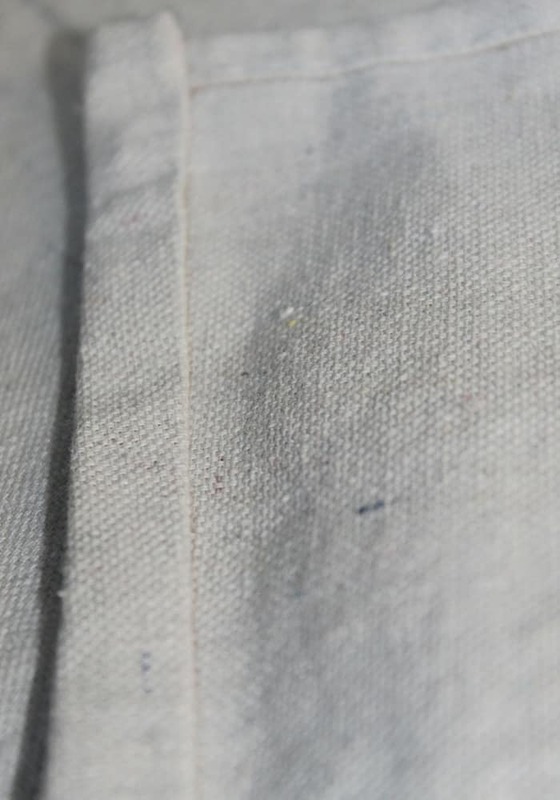 Here’s why I love drop cloths: If you were to go to the fabric store to buy canvas (or most other fabrics) you would end up spending way more to get that amount of yardage. 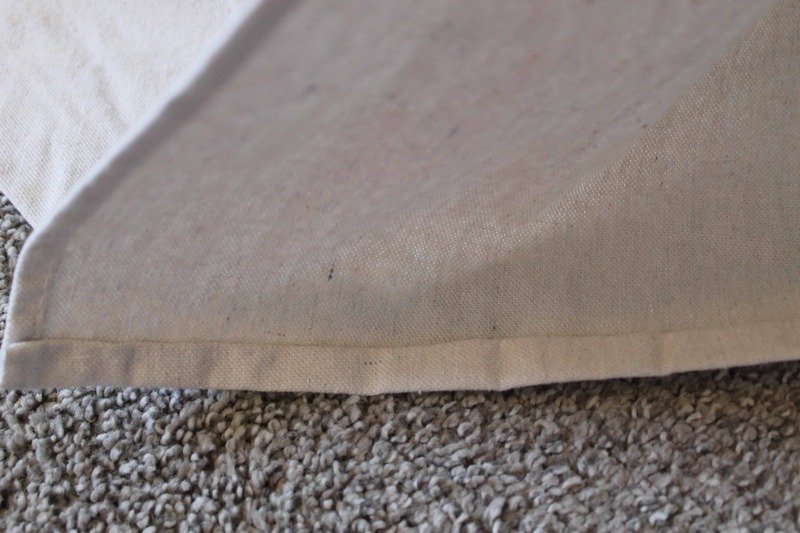 Since a drop cloth is just meant to be something you lay down on the ground to catch paint spills they can’t charge you very much for it, yet it’s the exact same material you would find at the fabric store! And the beautiful thing is that you will have a bunch left over from this project so you can go make yourself some throw pillows or something! Note: For other projects I like to wash the drop cloth with lots of fabric softener before use. However, for this project I like to fabric to be stiff so I don’t wash it and I just iron out the fold creases. 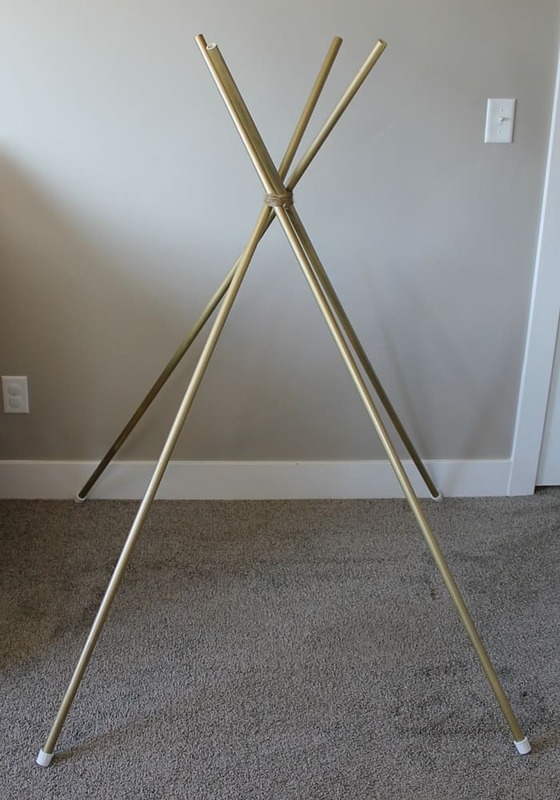 I choose to use PVC pipe instead of wooden dowels because they were WAY cheaper and easier to find. Drill a hole (big enough for your twine) 16 inches down from the clean edge of each pipe. Here’s a tip: Drill from each side instead of trying to drill all the way through (this will make your hole less jagged). Step out into a well ventilated area and spray paint the PVC pipes. Let them dry completely. Take your twine and tie a big knot on one end. Secure the other end with a piece of tape so that it will easily thread through the holes you’ve just created. Thread it through the 1st pole and tie a knot right next to the pole then wrap it around a couple times to stabilize it. Thread it through the next pole and repeat until all four poles are connected. Position the poles as pictured below and then tie off (but do not cut). 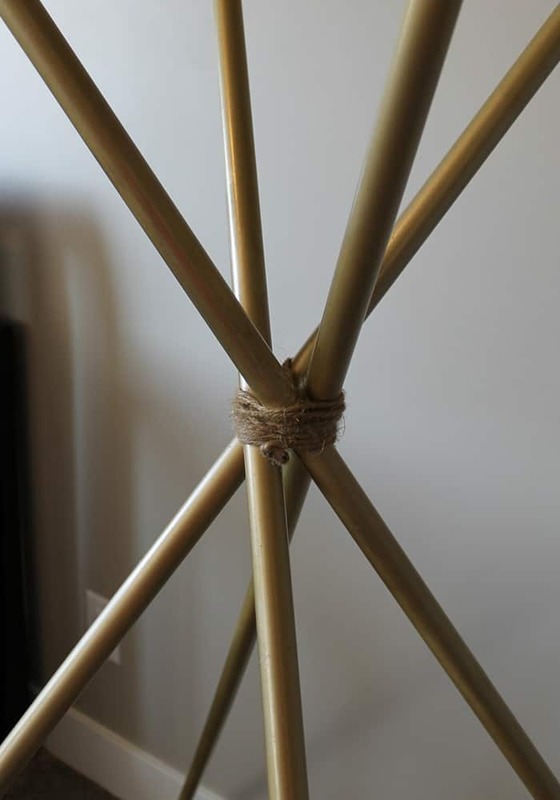 Keep wrapping the twine around the outside of all four poles several times to cover up the appearance of the holes. Secure the section you just pinned with hot glue. Optional: Once the glue has dried you can run a straight stitch over this section for added strength. If you wanted this to be a no-sew project you could certainly skip this step. 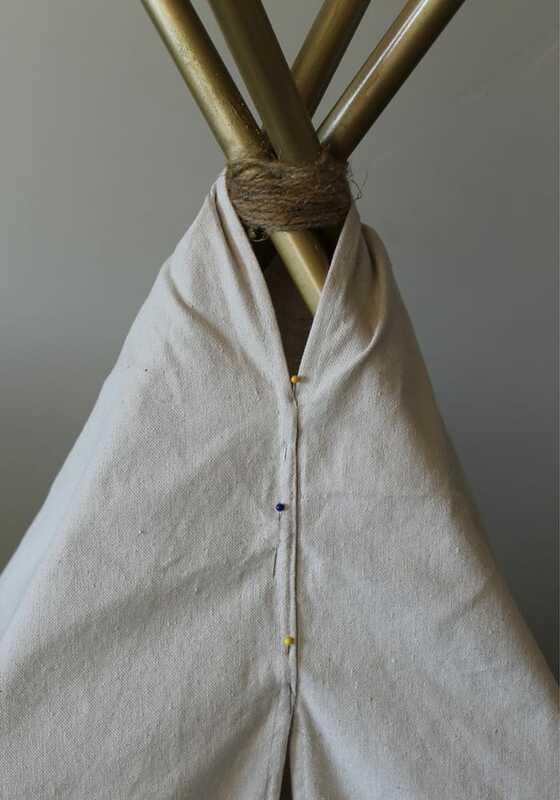 The key to the ease of this tepee is the size of the drop cloth. Since the back is already the correct length you don’t even have to hem that part (or where it meets in the front for that matter). Easy peasy! Voila! You’re done! Now the fun part….decorating! I wanted to keep this pretty gender neutral for future children so I did a removable string of tissue paper tassels that I tied with a slip knot. See the tutorial I used here. You could also paint designs on the canvas, use strings of pom poms, or add a dream catcher and feathers– the sky is the limit, really! 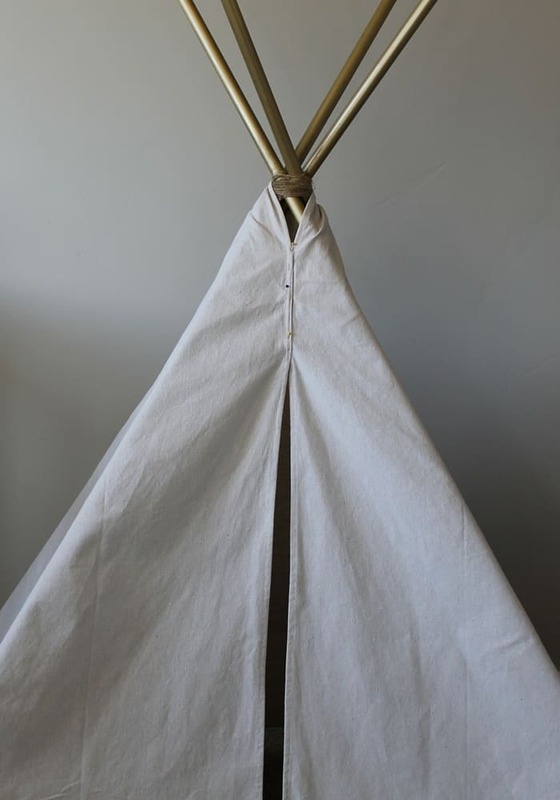 I’d love to see how you decorate your tepee! Feel free to comment below with pictures of your finished project! It serves as a fun little reading nook and the nice part is it easily folds up to be stored in the closet or under the bed when you need more space. The tepee stands about 5 feet tall (including the poles that stick up). The opening at the front is about 34 inches high. The inside of the tepee is about 30 inches deep and 50 inches wide. 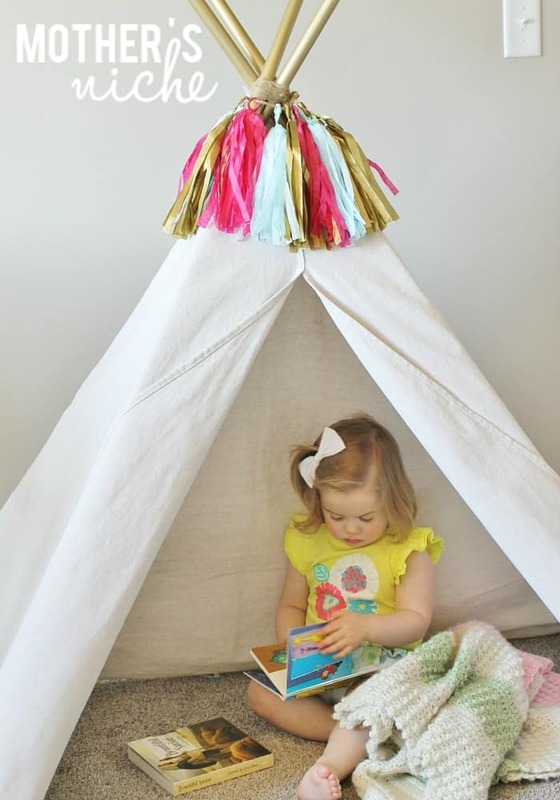 What are YOUR tricks are for making an EASY Toddler Teepee??? Hi ladies! I'm Natalie. Mom of two and married to the hunkiest man alive-- I'm definitely a lucky gal. I'm a stay at home mom, party planning enthusiast, frozen yogurt loving, chatter box. Great project Natalie! Thank you for sharing your project. Your photo of you daughter is adorable. I’d love to make one for my 4 year old granddaughter. 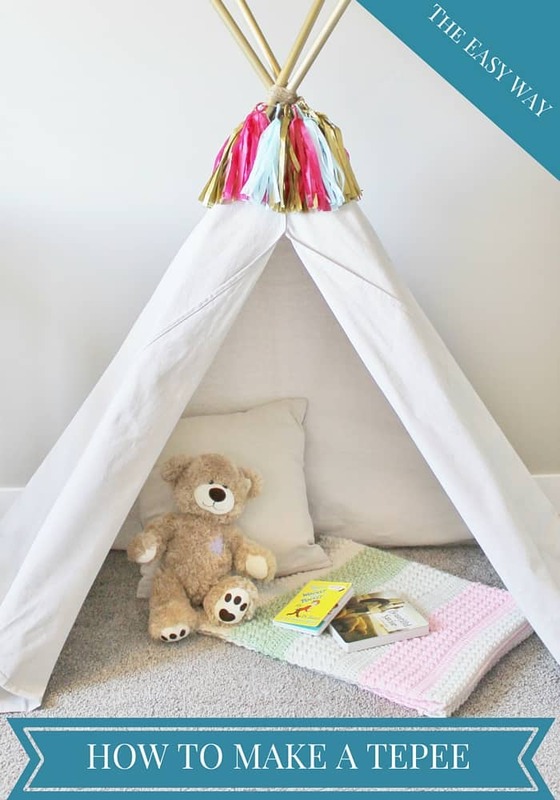 Do you think she’s too old to want a Tepee for a special place to play? I’m 32 and I want a teepee to play in! Lol seriously tho, I think it would be great for any age!! This is so cute. Your little girl is adorable too. She had good taste in books. I was curious, about how much would this cost with all the supplies? Adorable! What did it cost?